Sliced, fresh eggplant, breaded and flash fried; baked in a chunky tomato sauce with melted mozzarella; choice of meatball or italian sausage; salad, or minestrone soup. Layers of homemade pasta, meat sauce, mozzarella and ricotta cheeses; baked in our hearty meat sauce; choice of salad or minestrone soup. 2 Ravioli plus minestrone soup. Homemade pasta filled with ricotta cheese filling; baked in our hearty, red meat sauce; topped with creamy, white cheese sauce. *We have a gluten-free menu! *We have a Senior menu! *We have a Children's menu! 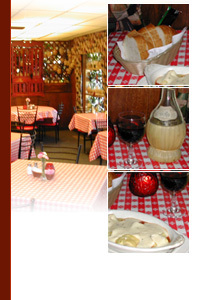 Luigi's Restaurant is one of the oldest continuously family owned and operated restaurants in Colorado Springs! Luigi's has over 1,100 wine bottles on our walls, all of them consumed here! Look around for straw basket wine bottles signed by customers honoring special occasions! YOU could be one of them! Famous people have eaten here and signed menus! Red Skelton, Bart Star, Annika Sorenstam, Jimmy Connors, Bonnie Blair, Forrest Gregg, The USA Hockey Team, Sweet Sixteen Basketball Coaches, and many more! Luigi's supports St. Paulo's and St. Mary's Churches and schools. Luigi's supports Tessa, NewBorn Hope , Interfaith Hospitality Network, Pikes Peak United Way, and many more worthy causes. Gina and Les are the last in the Cervetti family to operate Luigi's They have been working in the restaurant for the last 23 years. They have been the only family involved in the restaurant for the last 7 years. Gina is the daughter of the original owners, Leo and Anna Cervetti. Leo taught Les everything he knows about preparing Luigi's family recipes. Les makes our meatballs and Italian sausage right here! Our ravioli, lasagna, tortellacci and manicotti are homemade, by hand! Ravioli alone is a 3 day process that starts with roasting a turkey and a pork roast. The final step is the actual making done by our rav-tort crew of 5, plus Gina & Les. We make about 2500 ravs and torts every 2 weeks! The recipes have changed very little in 54 years, only when a product used in the recipe is no longer available, does anything change. Les and Gina have not, and will not change what Luigi's does best. Not changing is the key to our survival. Luigi's has struggled along with everyone, but we are surviving be because our loyal customers continue to support Luigi's even during this difficult economy. We thank all of you for choosing Luigi's when you dine out. Without your support, we will cease to exist. We hope Luigi's will be around for a long time, with your help, we just might make it! Luigi's can host YOUR smallparty, dinner club, book club, pre-concert group, etc. Please call Gina and reserve a time, 719-632-7339.